On the floating island of Skyloft, Link and Zelda prepare to take part in the Wing Ceremony, but a dark tornado pulls Zelda beneath the clouds to the forbidden "surface" realm. 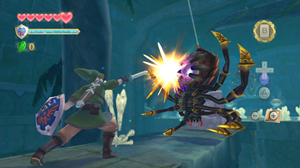 Link is guided by a fairy spirit named Fi to the Goddess Sword and must travel to the Surface to find Zelda and meet the destiny that awaits him. Taking place before all the other Zelda games, Skyward Sword describes the origins of the Master Sword and the kingdom of Hyrule. The game uses Wii Motion Plus technology for its swordplay, flying the Loftwing birds and using many of the items Link discovers on his quest. The main Skyward Sword theme is a variation of the song Zelda's Lullaby played in reverse. Just before the opening of the Wing Ceremony, Instructor Horwell says that this is the 25th Anniversary of the Academy. This is in reference to the Legend of Zelda series' 25th Anniversary, taking place throughout 2011. The Legend of Zelda 25th Anniversary logo also appears at the start of the game. After acquiring the Double Clawshots from the Lanayru Trial, return to the Skyloft Knight Academy. Zelda's room in the Academy is locked throughout the game. Climb up onto the roof and use the Clawshots to enter the chimney. Crawl through the crawlspace to drop into Zelda's room. On the desk in this room sits a Tingle doll. Before the final battle, you have to take on a hoard of Bokoblins at the Sealed Grounds. When they use their Monster Horns to call for reinforcements during this battle, they play an excerpt of the Flute Boy's song from The Legend of Zelda: A Link to the Past (this was the same excerpt Link would play after acquiring the Flute).